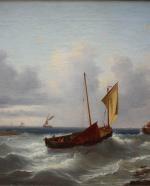 Classical seascape was executed by important Anglo-Dutch marine painter, drawer and lithograph Abraham Hulk Senior (London 1813 - 1897 Zevenaar). There exists a fine art family of Hulk painters as not only was Abraham Hulk Senior also referred to as Abraham Hulk the Elder, a painter, but so was his brother, Johannes Frederik Hulk Senior (1829–1911) and his sons Willem Frederik Hulk (1852–c. 1880), Johannes Frederik Hulk Junior (1855–1913) and Abraham Hulk Junior (1876–1898) too. Abraham Hulk Senior was the teacher not only for his brother Johannes Frederik but to most of his family members and also to the painter Adrianus David Hilleveld. Abraham Hulk Senior became one of the well known marine painters of his time in the 19th century and with that the patriarch of a whole family of Anglo - Dutch painters. He studied first to paint portraits under the portrait painter Jean Augustin Daiwaille (1786–1850) and after that at the Rijksacademie in Amsterdam. From 1833 to 1834 he traveled in America to New York and Boston where he exhibited his works. . In 1834 he returned to the Netherlands where he first lived in Amsterdam and from 1834 to 1896 in The Hague and Leeuwarden. In the meantime from 1855 to 1856 first in Enkhuizen and afterwards in Oosterbeek and Haarlem, but returned for good in 1870 to England, where he lived till his death in 1897. Although most literature states that he died in London, he actually died on a short visit in Zevenaar in the Netherlands. He became well known because he seemed to have the ability to paint the sea and its ships in such a different way for which he became one of the great marine painters. Some of his portraits have survived. His work was exhibited in the Royal Academy in London from 1876 to 1890 where he entered three paintings of which two were Dutch seascapes. He also exhibited at the Suffolk Street Galleries in London and in Leeuwarden and The Hague in the Netherlands from 1843 to 1868. His works hang in the Amsterdam, Dordrecht, Haarlem and Enschede museums. Literature: Thieme/Becker "Allgemeines Lexikon der bildenden Künstler von der Antike bis zur Gegenwart".